Somewhere between the realms of geek culture and home fiction, there are several groups who gather and form speculative fiction stories based around the culture they love. --- From the role playing and anime to the Wars and Treks in space, you can find a group for almost everything in geekdom. Drawing in creative minds on both a writing and fantasy level while staying true to the original story it spawned from, not to mention conventions and educational groups devoted to the works. And the majority of those groups all partake as part of a council. The Utah Speculative Fiction Council to be exact. I got a chance to chat with council president “Joe M” about the group, its history, what it does for the community and groups, and plans for the future. Gavin: Hey Joe, first off, tell us about yourselves. Joe: The members and leaders of the Utah Speculative Fiction Council (UtahSF) are drawn from a variety of local science fiction, fantasy, and horror groups, clubs, and other organizations. A need was seen when several of us who work with and are members of multiple local clubs and groups discovered there was another group that no one seemed to be aware of. After that experience, we thought it would be useful to have a common forum to help everyone learn about everyone else. Since then, we have done a lot of promotion for as many groups as we can find, and tried to make sure that the word is out about all the various groups out there. Gavin: For those who don't know, what is the USFC? Joe: The Utah Speculative Fiction Council was founded as a 501(c)(3) non-profit organization as a way to help bring speculative fiction-related groups together so everyone could benefit from the wide range of knowledge, talents and abilities of all the members. UtahSF encourages communication between all the various groups by offering various methods such as email mailing lists at no charge to its membership. We also try to promote local talent such as authors and artists, as well as local speculative fiction events and activities by letting people know about upcoming events which feature these individuals and groups. We also work to promote Reading For the Future, a local organization which provides books free of charge to libraries and schools in need of them. Additionally, UtahSF was instrumental in bringing the 2008 World Fantasy Convention to Utah. Gavin: Where did the idea come from to start the council up? Joe: We (the founders) discovered there was a local science fiction and fantasy convention being planned, and that no one was aware of it within any of the groups we knew about. After we contacted this group, several of us got together and tossed around ideas until we came up with the beginning of an idea for the group. We determined it would be best if the organization was one not directly connected to a specific group in order to maintain independence from any one group or other organization. Gavin: How did you go about getting set up and finalizing the structure of it? Joe: There were several attempts, first within one of the local groups, and then as a separate group, to come up with what eventually became UtahSF. The most important things we wanted to accomplish were to 1) establish an independent organization which could benefit all speculative fiction groups in the area, and 2) provide a way to share information between all the various groups as well as spread the word to as much of the interested local public as possible. There were a few different organization meetings, but everything was finalized in April 2005. Gavin: Were there any groups you sought out to join, or did you simply open up and wait for groups? Joe: We contacted all of the local organizations, clubs, and other groups of which we were aware and for which we could locate contact information. We are also open to any group which wishes to join. There is currently no charge for a group being a member of UtahSF, and we offer a lot of useful tools to help people spread the word about their own groups and find out about others. Gavin: Who are some of the members you currently have under the banner? Joe: There are quite a few, actually. We have conventions such as Anime Banzai (anime convention), CONduit (general science fiction convention), Life, the Universe, & Everything (actually an academic symposium), and Mountain-Con (media science fiction convention), and we sponsored and staffed the 2008 World Horror Convention (a convention for professionals in the horror fiction field). Many local fans also helped out with staffing and running the international costuming convention, Costume-Con 23, in 2005, very shortly after UtahSF was organized. There are also a large number of clubs which are members, including the Belegarth Medieval Combat Society, End of the World anime club, Quark Science Fiction and Fantasy Club, Rebels Associated (a Star Wars club), SLAAKers (an anime club), a number of Star Trek clubs (USS Alioth, USS Kelly, USS Ticonderoga, and USS Ursa Major), the Utah Filk Organization, and the Utah Costumers Guild. Related to a previous comment, Reading For the Future Utah is also a member organization of UtahSF, and we try to assist them as we can with their book drives. Gavin: What kind of assistance do you normally offer them? Joe: One of the main things we offer is communication. We operate a large number of general and organization-specific email mailing lists which are used for communication within specific groups as well as for intergroup communication. We help these groups gets flyers to the various conventions to help get the word out. And, at our quarterly meetings, groups are encouraged to bring flyers and bookmarks for others to take and distribute to bookstores, game stores, and other locations around Utah. We also have a lot of people working with us who have been running various organizations (clubs, conventions, and so on) for many years; some have over 30 years' experience in these areas. All of this allows us to offer experienced assistance to people wanting to start up a club, a convention, or just offer help if they need it. Gavin: Is there any bickering between groups since some of them operate within the same fictional universe, or do they generally get along? Joe: There will always be some disagreements between people, but fans in general are very friendly people and all of the groups we work with generally get along. Utah has far fewer problems that most other states as far as bickering goes. Fans in Utah are, for the most part, very supportive of the other groups. We really want everyone to succeed. When there are disagreements of one sort or another, there are people in our various groups who try to find common ground and get things worked out. This tends to be much more effective in the long run as we can always accomplish more if we're working together to help each other out. Gavin: How do you go about planning festivals and events to showcase these groups? Joe: We haven't done any cross group events for the most part yet, but we do have some ideas for things to do in the future. I think it would be wonderful to have some sort of Speculative Fiction Day event where all the various groups could participate in some way and share with the community at large. These kinds of events are being considered. 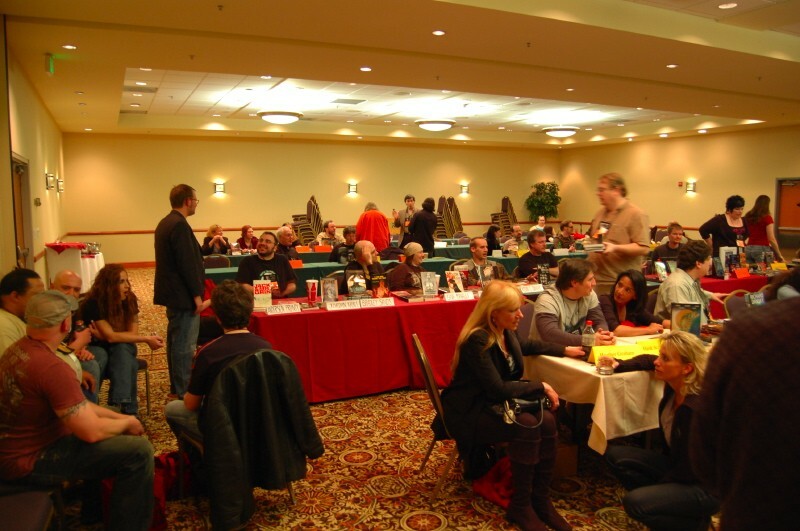 When UtahSF sponsored the 2008 World Horror Convention, people from all the other conventions and several clubs stepped in to help organize and run the event. This helped the convention be very successful and well received by the attendees. Gavin: Do you work with any organizations like yourselves out of state, or primarily focus on Utah? Joe: We've had some contact with groups in Washington state, Idaho, and Colorado, but there aren't a lot of umbrella groups like this around out there (as far as we know). We are certainly interested in working with other groups, though, as it will only provide more avenues for the member groups of UtahSF to be promoted to a larger audience. There are groups which work with Fandemonium (an Idaho convention), MileHiCon (Denver), and a large number of local fans volunteered to help run various parts of Denvention 3 (Worldcon) in 2008 in Denver. Some local fans have also helped at SakuraCon (in Seattle). Gavin: If someone wanted to join, what are the requirements and the process like? Joe: The best thing to do is to go to our website where we have all the requirements to do so. You can also come to our quarterly meetings where we go over business and discuss what we can do to help each other. The next meeting is on our site in the top right corner: Saturday, March 14, 2009 at the Salt Lake City Main Library. Gavin: Do you take offense to the idea that some believe its just "fan fiction", or is that more par for the course with people who don't know more? Joe: We like to think we cover a wide range of speculative fiction interests. From fan fiction (those who write stories based in their favorite media or literary world) to New York Times Bestselling authors and academic discussions on the literary aspects of SF&F; from Star Trek clubs and the Society for Creative Anachronism to creating historically accurate costumes for theatrical productions and manga to classic SF. It's certainly true that some people just dismiss science fiction, fantasy, horror, anime, etc., because they don't understand it or it doesn't appeal to them, and that's perfectly fine. The range of interests is as varied as the variety of speculative fiction groups in Utah. UtahSF is just there to help people find that niche for themselves, and to allow them to let others know about it, too. Gavin: Do you ever take part in local festivals or conventions, or leave that more to the groups to take part in? Joe: We allow all the groups, festivals, and conventions to do their own thing. UtahSF doesn't want to try and run things for people. Instead, we are here to assist them, and we have a number of people who go to most or all of the local events and help out where they can and where needed. I think it's far more interesting to see all the different approaches taken to the same set of problems encountered by the various groups, and then try and distill those approaches and spread the best methods around to other groups. In this way, everyone benefits from everyone's knowledge and experience, but without trying to force people to do things a specific way. Gavin: What can we expect from you guys the rest of the year? Joe: We're looking at bringing other roving conventions to Utah. (Conventions that are run by different groups in different parts of the world every year.) We are also working out the details for a periodic speculative fiction newsletter which will cover local events and let people know about upcoming events, club activities, and so on. We'll be having our quarterly meetings, and we'll continue to seek out new groups to help out. You can find out a lot of information on our site. Joe: We have several confirmed member (and non-member) conventions and events coming up this year: Utah Renaissance Festival & Fantasy Faire, May 8-10 and 15-17, 2009 in Marriott-Slaterville, Utah. CONduit is coming up May 22-24, 2009 in downtown Salt Lake City. Anime Banzai is coming up October 16-18, 2009 in downtown Salt Lake City. Life, The Universe, & Everything is held annually in February or March at Brigham Young University down in Provo. It's an academic symposium on speculative fiction which focuses on writing, literature and art.